Matt Miller earned his second UMP Late Model feature win of the year at Oakshade Raceway over some very stout American Late Model Series (ALMS) competition. Last week’s feature winner, Rusty Schlenk, took the early lead in the caution-free 30-lap ALMS feature event with Miller pressuring to the inside in the first few laps. Miller eventually got the lead and pulled away from the rest of the field. Despite a close call while lapping Curtis Deisenroth, Miller held on to a sizable lead over Brian Ruhlman on his way to the $2,000 victory. 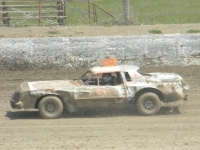 Mike Spatola from Manatten, Illinois finished third followed by Jon Henry who gained nine positions during the race to finish fourth. Schlenk slipped back to finish fifth. Bob Gregory picked up his second UMP Sportsman feature win of the year by holding off a late charge from Matt Lindsey. Gregory led from the drop of the green flag and fended off Bruce Stuart early. Multiple cautions kept things tight as Lindsey worked his way up to second and challenged Gregory all the way to the checkered flag. Lindsey came up a little short even after one last shot at trying to get to the inside of the leader on the final lap. Stuart finished third with Tim Line, winner of the last week’s feature, ending up fourth. Rich Ruff slipped back to finish fifth after starting on the outside of the front row. Jeff Foks snatched the lead from Terry Rushlow on the second lap of the UMP Bomber A Main and held the lead for the remainder of the race. A late caution brought out by a Satch Crispen spin set up a two-lap race to the finish and gave Rushlow one last chance at Foks, but Foks had him covered and picked up his third A Main win of the year. Doing double duty was Tim Line who started 12th and finished third behind Rushlow. Jeff Geis finished fourth with Adam Noonan ending up fifth. The craziest feature of the night had to be the in the Hornet division. “Sparky Marky” Gillingham led the first half of the race with last week’s feature winner Drew Smith right on his rear bumper. Smith got into the rear of Gillingham in turn four and sent him spinning. A couple other cars were collected in the incident including third place William Cundick. Smith received the black flag for rough/over aggressive driving which turned the lead and eventual win over to Brandon Myers. Josh Froelich finished second followed by Maverick Wright, Breanna Franks and Cody Laney. Spinning leaders were a common sight in the UMP Bomber B Main. Mike Grames had a great run come to an end after leading the first half of the race only to end up spinning in turn four turning the lead over to Josh Sisty. Three laps later, Sisty spun in turn two and turned the lead over to Tony Sylvestri who had been putting the pressure on. Sylvestri went on to hold off Kevin Cole in the final lap after a late caution set up a one-lap race to the finish. John Gamber finished third followed by Randy Murday and Rick Dixon. An interesting finish in the UMP Sport Compact feature capped off a great night of racing at Oakshade Raceway. Derek Morris and Steve Morris were once again the class of the field and took to the top two positions right after the drop of the green flag. Derek Morris led until he lost a tire coming off turn two with just two laps to go. Steve Morris took over the lead with Logan Hough in tow. Morris held on to pick up the victory with Hough having to settle for second. Rich Fowler started on the pole and ended up third with Regan Ford and Stephanie Miller rounding out the rest of the top five finishers. Exciting racing action continues next Saturday, June 2 with another full show of UMP Late Models, UMP Sportsmen, UMP Bombers, Hornets and Sport Compacts. Gates open at 4pm with racing at 7pm. 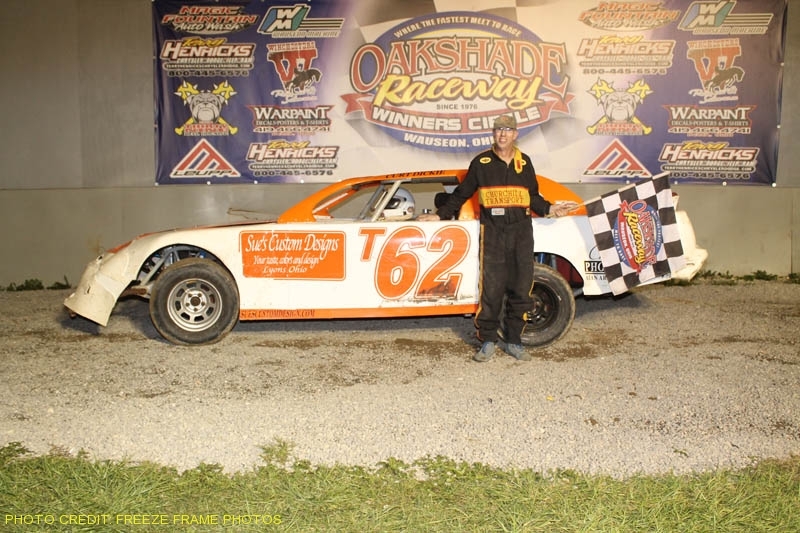 Defending Oakshade Raceway Late Model Champion Rusty Schlenk finally found his way back to victory lane for the first time this season on Saturday night. Schlenk started on the pole of the 25-lap feature event and had to fend off some early pressure from Matt Miller. Then, on lap eight, Miller slowed to a stop at the end of the backstretch which drew one of the many cautions in the race. As soon as the yellow flag waved, Miller darted back to the pits and was able to rejoin competition at the back of the field as they were about to go back to green. Caution flags continued to keep the field tight the remainder of the race, but Schlenk held off Andrew Reaume to pick up the checkered flag. It was the second runner up finish in as many weeks for Reaume. Matt Miller worked his way back up through the field for an impressive third place finish. Devin Shiels finished fourth with Mike Bores improving eight spots from his starting position to cross the finish line in fifth. Bruce Stuart led the first couple of laps in the UMP Sportsman feature event until Tim Line took it away on lap three. The two drivers continued battling for the lead with last week’s feature winner, Bob Gregory, joining in to make it a three-car battle. Stuart reclaimed the lead for on lap nine, but Line got back by a lap later and went on to keep both Stuart and Gregory behind him at the finish. 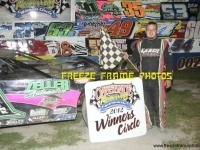 It was the second feature win of the year for the defending Oakshade UMP Sportsman track champion. Stuart finished second just ahead of Gregory. Mike Jessen was fourth with Joe Smith fifth. Jeff Foks tried to pull away from all the competition with the lead in the UMP Bomber A Main, but a slew of caution periods kept canceling out any lead Foks managed to build. A scary looking incident brought out the red flag on lap four when Donovan Paskan, Gary Schaffer and Roscoe Stetten tangled coming off turn four launching Schaffer’s car up and over onto his roof. Schaffer climbed out uninjured. A green-white-checkered two-lap race to the finish was set up after the last caution period as the time limit for the race had expired. Foks was able to hold off Terry Rushlow for the win. Jeff Geis started 20th and got by Adam Noonan in those final laps to finish third. Finishing in fifth behind Noonan was Chris Sands who also started at the tail of the field in 22nd. “Sparky Marky” Gillingham looked to be on his way to his second Hornet division feature win of the year leading the entire way to the white flag. Coming off turn two on the final lap, Gillingham slipped off the pace allowing both Drew Smith and William Cundick to get by before coming back up to speed. Smith went on to pick up his second consecutive Hornet feature win with Cundick second. Gillingham settled for third followed by Josh Froelich and Cody Laney. Taylor Dippman had a strong top five run going until she crashed into the wall coming off turn two on the final lap which knocked her back to a 10th place finish. In more UMP Bomber action, Greg Whitehead led the first five laps of the B Main until both Dave “Gumby” Golembiewski Jr. and Curt Lancaster got by for the top two positions. Golembiewski and Lancaster battled side by side for the lead at the white flag, but a late race caution set up a one lap dash to the finish with a single file restart. 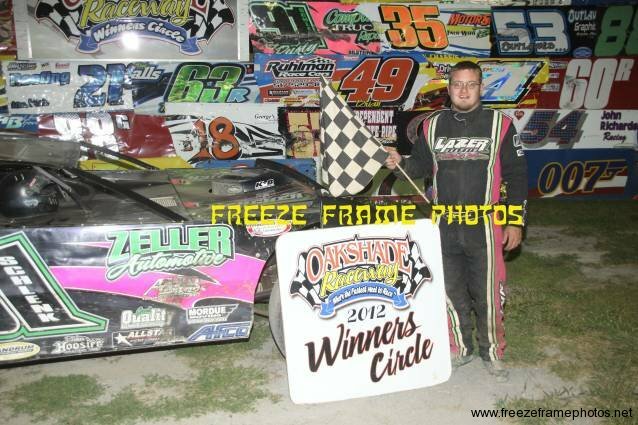 Golembiewski held off Lancaster to pick up his first feature win at Oakshade Raceway. Lancaster settled for second followed by Rick Dixon, Richard Riffe and Greg Whitehead. Father/son dual Steve and Derek Morris dominated action in the new UMP Sports Compact class at Oakshade taking the top two positions in both the heat and feature events. Steve Morris led early, but Derek took over the top spot soon after on his way to his third consecutive feature win of the year. Steve Morris took second. Stephanie Miller held off Logan Hough to finish third with Regan Ford rounding out the top five finishers. Saturday, May 26 marks the first American Late Model Series show of the season at Oakshade Raceway paying $2,000 to the winner. UMP Sportsmen, UMP Bombers, Hornets and UMP Sport Compacts will fill out the rest of the evenings racing with gates opening at 4pm and racing at 7pm.